Paul Stanley needs no introduction. Every song at a Kiss live show, however, seems to need one, a completely insane overly-rehearsed one at that, and some mad genius out there has finally made a CD-length compilation of some of the gems in the Paul Stanley Crowd Interaction canon. My good friend Dave Viola, who’s been obsessed with Stanley’s on-stage patter for countless years, tipped me off to this one — he’s the one who pointed out to me that Stanley, in-between songs on-stage, sounds less like the frontman for an internationally known rock megaband than a shrill Christopher Street queen stuck outside a club at three in the morning, frantically searching on the wet pavement for the last few poppers that accidentally flew out of his hand onto the ground. The ZIP file below of 70 tracks’ worth of Stanley shenanigans has already been posted elsewhere on the web, but it’s good to get this kind of stuff as much exposure as possible. POISON, one of hard rock's most iconic, enduring and controversial bands, celebrates 20 years in 2006. To commemorate this anniversary milestone and the band's career tally of more than 25 million albums and DVDs sold around the world, POISON and Capitol/EMI Music Catalog Marketing have partnered to release "The Best Of Poison: 20 Years Of Rock" on April 4. The new 18-track collection packs POISON's biggest hits and fan favorites and will also debut the group's explosive new version of GRAND FUNK RAILROAD's "We're An American Band", produced by Don Was (THE ROLLING STONES, BOB DYLAN). In May, POISON will hit the road for a major 20th anniversary summer tour sponsored by Live Nation! and presented by VH1 Classic. January 18 : KISS The Forgotten Songs Project continues in 2006! The new year starts with a really special tribute to one of the most famous rock bands in the whole world, talking about KISS. Mike Stone finished with his "Forgotten Songs" project another unreleased KISS song, completely new arranged and recorded with a bunch of musicians all over Europe! This time it is the song "None of your business", which was firstly planned to become part of the KISS album "Destroyer" in 1976, but then became already sorted out during the recording sessions. 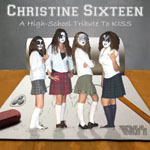 Originally sung by Peter Criss, the new recording is surprisingly performed by a lady, Nina M. from the famous band FRANTIC, some additional vocal parts are supported by Mike Stone himself. Get a free download of "None of your business" on the Mike Stone fanpage www.mikestone.tk, on which you are also able to catch the former Forgotten Song "Baby O" in complete length from now on! For more details and updates, just visit the official Mike Stone homepage www.mikestone.beep.de! 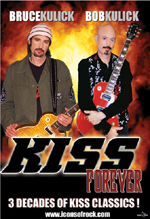 Former KISS guitarist Bruce Kulick will be at this year’s NAMM convention (taking place from January 19-22 at the Anaheim Convention Center) to launch the KISS Forever instructional DVD. Apart from Bruce, his brother Bob Kulick is also featured on the DVD, which will be released next month by Music Star Productions as part of their Icons Of Rock instructional series. Kiss Forever will feature each guitarist explaining selected KISS classics in their entirety. 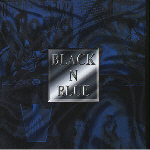 Bob and Bruce chose songs during their tenure in the band for inclusion in this DVD. Bob Kulick will also be at NAMM, along with engineer Brett Chassen, to promote their new DVD Pro Tools: Behind The Controls. Bob Kulick, has performed as KISS' session player from the late 70's to early 80's appearing on albums such as; KISS Alive II, Paul Stanley Solo Album and KISS Killers. 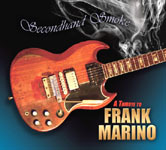 He has also supplied his talents to recordings from bands such as; W.A.S.P and Meat Loaf. Bob has also recently won a Grammy award as a producer for his work on Motorhead's "Whiplash". Bruce Kulick was KISS' lead guitarist from 1984-1996 and has performed guitar duties on many multi-platinum recordings and world tours for the band. Bruce, who has recently released his second solo CD is currently performing with Grand Funk Railroad and Union, a band also featuring former Motley Crue vocalist John Corabi. Visit Music Star Productions at booth #5810 for performance and signing schedules. John Corabi, frontman and guitarist, has just recently launched his first official website, www.john-corabi.net. Corabi has fronted such bands as The Scream, Motley Crue, Union, and the Cardboard Vampyres. John-Corabi.net offers fans regular messages from John, where John writes in and fills everyone in on what he is currently working on, and complete Bio and Discography pages with lyrics to all the songs that John has written. Fans can also find exclusive merchandise on this site, lots of pictures from throughout John's career, and multimedia features are on their way. Corabi is very excited about the potential for the site. There are plans for new songs to be made available for purchase exclusively on the website. When a fan signs up for the newsletter they will be notified when new material is available, and when new tour dates for any of the bands that John appears with are announced. The website is just one of many projects that Corabi is involved with right now. He is currently writing material for his long awaited solo release, and he has signed a publishing agreement with Paramount Music in Nashville. Gene Simmons and Simmons Records recording artist BAG have teamed up to write the official theme song for the ‘I Am Indy’ campaign. Gene Simmons and his Simmons/Abramson Marketing company will be responsible for the marketing campaign of Indy Racing League’s 2006 season. Gene and his partner Richard Abramson - who in his approx 3 decade career managed Paul Reubens (Pee-wee Herman) and was responsible for marketing campaigns for major film studios like Warner Bros and Universal - will be actively engaged in Indy Racing League’s marketing, event, public relations, sponsorship, merchandising and branding efforts, including the famous Indianapolis 500. 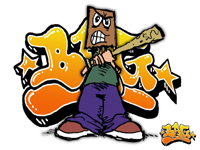 BAG: “Gene first approached me in September 2005 with the concept for the tune. UK re-issue label Rock Candy Records has announced details of it's latest release "Billy Squier - Tale Of The Tape" due January 23. 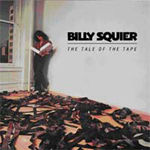 Billy Squier - Tale Of The Tape - It takes a brave man to go it alone, in music or in life, and with Tale Of The Tape Boston-born Billy Squier showed he had sufficient backbone (and material) to put his own name squarely behind his songs. Track Listing: The Big Beat . Calley Oh . Rich Kid . Like I'm Lovin' You . Who Knows What A Love Can Do . You Should Be High, Love . Who's Your Boyfriend . The Music's All Right . Young Girls . 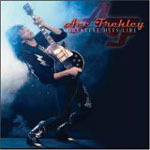 Bonus Tracks: The Music's All Right (acoustic demo) . Young Girls (acoustic demo).